GTA Online players that complete the Flight School Event playlist will get access to the 'High Flyer' Parachute Pack. This yellow and green monstrosity can be purchased from Ammu-Nation for free after finishing off the playlist. Additionally, aviation-themed activities will have better-than-normal progression. Players will receive double GTA$ and RP from all the jobs in the Flight School playlist. The payouts for all Air Races and Parachute Jumps have likewise been doubled. You'll get double the normal bonus for flying under bridges during air races, too. The boosted progression also applies to new Gang Attacks at the San Andreas International Airport Hangar, and the Sandy Shores and Grapeseed Airfields. "Your dogfight victims won't be the only things falling from the sky this weekend: look out for special Crate Drops containing extra GTA$, RP bonuses, Miniguns, RPGs and Sticky Bombs between now and Sunday night," reads a new dev post on Rockstar Newswire. Los Santos' businesses are offering discounts throughout the weekend, too. Luxury apartments Del Perro Heights Apts 7 & 20 and 0120 Murrieta Heights Properties are 25% off their usual price. Each of these properties comes with a 10 car garage. Aircraft are cheaper as well. If you want a Helicopter Pickup from Merryweather, it'll cost $500 instead of the usual $1000. Lester, meanwhile, will help you locate planes or helicopters for free. 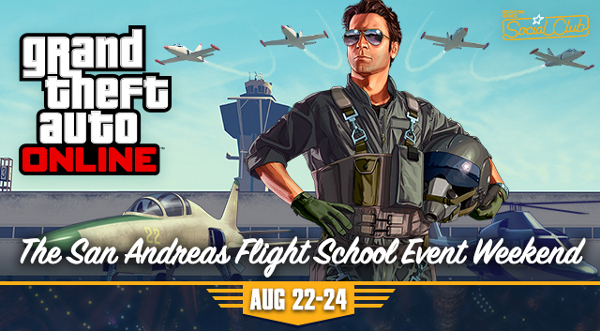 Rockstar is hosting three contests during the Flight School Update weekend. Players can take photos in GTA Online and tag them as #FLIGHTSCHOOL for a shot at $1 million in GTA$ and a MILEHIGH vanity plate. The best Air Races created by users will also get $1 million, along with a license plate that reads "AVIATOR." Again, these jobs needs to be tagged #FLIGHTSCHOOL to be eligible. The final contest is your average sweepstakes. You can enter for a chance at prizes here. "We'll be giving away 20 deluxe GTAV & Rockstar T-shirt Prize Packs including the Trevor Philips Industries Tee, San Andreas Federal Reserve Tee, Los Santos Lifeguard Tee, Republican Space Rangers Tee,Bugstars Logo Tee, Los Santos Tee, the GTAV & V Logo Tee, Kifflom Tee, Rockstar Rolling Long-Sleeve Tee, Rockstar Mason Tee, and the Rockstar Flowers Tee." GTA Online's Flight School Update went live on Xbox 360 and PS3 earlier this week. The Flight School Update introduced several new aerial challenges, vehicles and missions to the game. It also removed the penalty for replaying missions. You can find out the full list of additions, bug fixes and balance changes here.